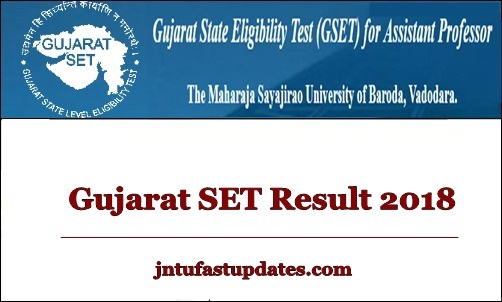 Gujarat GSET Results 2018: The Maharaja Sayajiroa University of Baroda, Vadodara conducted the State Eligibility Test (SET) on 30th September. Many of the competitors aspiring to become assistant professor/lecturer in the state of Gujarat have competed for the GSET examination. The Maharaja Sayajiroa University of Baroda has organized the Gujarat State Eligibility Test in many examination centers across the state. The university has taken several measures in conducting the test across the state. As per reports, more than 1 lakh aspirants have competed for GSET examination this year. The conducting university has released the answer keys of GSET examination after the examination has been done. Hopefuls who are presently waiting for Gujarat SET Results will have to wait for few more days to check the GSET result, score, rank, cutoff marks, and merit list. The Maharaja Sayajiroa University of Baroda will soon announce the result on gujaratset.ac.in. Aspirants competed for GSET can stay checking the GSET portal for more updates. The Maharaja Sayajirao University of Baroda is the well-established University of Vadodara. The University is recognized by UGC, New Delhi for organizing the SET examination in the state of Gujarat. The University was established in the year of 1949. The University offers various courses such as technical, science etc. The MSU conducts State Eligibility Test for aspirants seeking to become Lecturer/Assistant Professor in various Government/Private colleges in Gujarat state. The Gujarat State Eligibility Test has been conducted for 23 subjects. The examination has organized in 6 examination centers in the state of Gujarat. All the hopefuls competed for the test on 30th September can check the details of result date, and more updates from this article. Aspirants competed for Gujarat SET examination on 30th September and waiting for the results can shortly expect the results. The Gujarat SET Results 2018, cutoff marks, merit list is expected to release in 3rd or 4th week of October (tentatively). Candidates have to wait until the result date is announced. The Gujarat SET Cutoff marks /qualifying marks 2018 will be announced at the time of results. Candidates can check with the qualifying marks to know their future contending for the next levels. Gujarat SET results will be accessible on gujaratset.ac.in. Keep checking the page regularly for latest updates such as result date, cutoff marks, merit list etc. List of Roll Numbers of Provisionally Qualified Candidates in Gujarat SET Examination Conducted on 30 th September 2018.Check From Above link. On the homepage, click on ‘GSET Results 2018’. The GSET Result will appear on the screen.